World Families Forums - off the wall thought - both R1a and R1b spread through Corded Ware?? off the wall thought - both R1a and R1b spread through Corded Ware?? 1. R1b in its L23* form exists at the east end of the Danube/SE Europe from perhaps 5000BC. 2. That might even mean it could have been within pre-Corded Ware TRB culture although I wont push that element. 3. Perhaps it initially travelled as L51* and then L11* in the Corded Ware period and arrived in a form that was still L11* in both the later U106 origin point in the Baltic and in the western ends of the Corded Ware area near the Rhine (not sure where along the Rhine). 4. Somewhere on the western fringes of Corded Ware from Holland to Switzerland the L11* elements came in contact with early pre-full package beaker cultures (which in this model are not R1b). 5. The 'beaker people' are basically beakerised corded ware L11* lineages. 6. P312* could have arisen perhaps in the upper Rhone in the beaker-corded ware hybriding area which would coincide with the area of highest P312* variance. 7. From this area the secondary take off of the 'beaker people' lineage would be very well placed to access all the main route that would spread P312 - including the Med. via the Rhone, the Rhine via the Rhine-Rhone source areas, central Europe via the upper Danube and the Atlantic via the Loire and Seine. Re: off the wall thought - both R1a and R1b spread through Corded Ware?? Alan Trowel Hands says: “Add to this that upstream form of R1b like L23 and L51 are more eastern and you get the general idea”. This isn’t true at all. In my researches and in the Argiedude’s map. R-L51 was 0,3% eastward of Italy and at 4% in Central-North Italy. Also the data published by Rich Rocca in another thread, centred on France, don’t attribute noticeable values to East Europe and less to Middle East. Also about R-L23, which is my haplogroup, I have written so much. Balkans get the “Albanian” or “Balkan “ cluster. Middle East has many subclades not known in Western Europe, like L584. Eastern R-L23 probably has nothing to do with the Western European subclades. I have never argued for an origin for P312 in Western Europe. I assume that it arose somewhere before or during the 3100+ BC movement up the Danube from the steppe. I'm assuming that you meant U106 in your title, rather than R1a. In my current online text I say "R1b-U106 has its peak in northern Europe and a distribution which correlates fairly well with Germanic speakers, past and present. A sprinkling of men within that distribution carry the parent clade R1b-L11*, opening up the possibility that R1b-U106 arose from R1b-L11* in Northern Europe. However its density of distribution there suggests that it arose at the head of a wave of advance into Northern Europe." So I have both P312 and U106 probably arising fairly close to each other among the L11 presumed to be on the steppe c. 3500 BC. I don't think we can pin origins down any more closely than that on current evidence. Bear in mind that both started in just one man, who is not alive today to tell us where he was born. If I am right that both arose at the head of a wave of migration, then the two men in whom they arose were on the move, their descendants were on the move and none of them are sitting patiently in the place where these mutations arose, waiting to assist us in our enquiries. The wave of migration is suggested by the indications of a rapid increase in population i.e. the survival of a bunch of subclades very soon after P312 and U106. ..... So I have both P312 and U106 probably arising fairly close to each other among the L11 presumed to be on the steppe c. 3500 BC. I don't think we can pin origins down any more closely than that on current evidence. Bear in mind that both started in just one man, who is not alive today to tell us where he was born. If I am right that both arose at the head of a wave of migration, then the two men in whom they arose were on the move, their descendants were on the move and none of them are sitting patiently in the place where these mutations arose to provide evidence for our musings. My best attempt to derive (using Nordtvedt interclade) the most probable and high confidence time ranges for the TMRCAs of the L11 family (although not L11 himself) is in this chart. I interpret the results so that U106 started expanding slightly later than P312 but all of L11's big subclades expanded quickly and almost simultaneously. 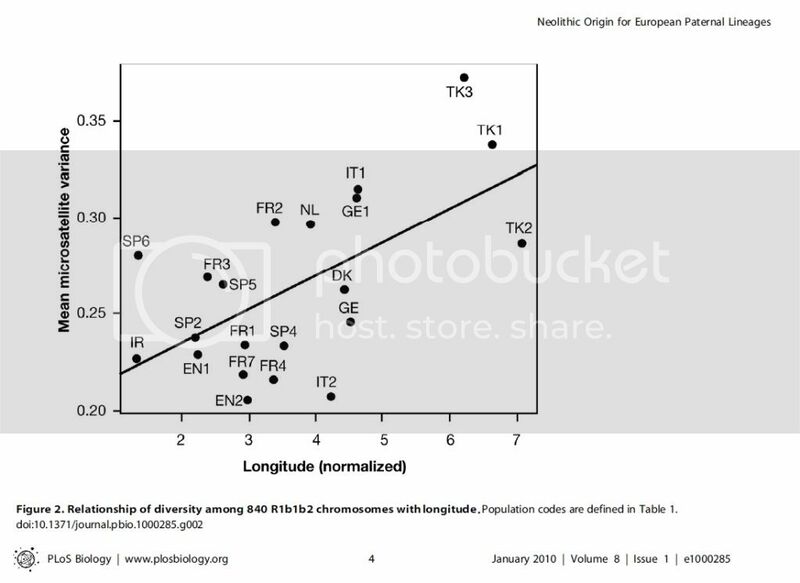 This is really not in disagreement with Busby's finding that R-L11(S127) had similar STR diversity all across Europe, just that I have a different interpretation. Of course, Barlaresque, thinks there is a east/west cline with the east more diverse (older.) I agree with that too, but it is arguable that the differences are insignificant. I think we can put this into perspective with your comment "Bear in mind that both started in just one man." By the mid to late Bronze Age, I think we could look at U106, Z381, Z18, P312, L21, U152, L2, Z196 as nearly just private SNPs in the L11 subgrouping (cluster) on in a surname project. Perhaps this was the Richards, Richardson, Richart, Ricardo clan. I find a little bit ridiculous this theory of a clan which gave origin to all Western Europeans and much more. A similar situation is more likely with an expansion from a bottleneck, like that of the Younger Dryas. Anyway the problem will be resolved by the aDNA and all turns around the age of these haplogroups. I remember to you all that many markers get the same value with hg.Q, and the separation happened at least 20,000 years ago. I'm not saying there couldn't have been a bottleneck before the explosion of the R-L11 family in Europe. Of course there could have been. Notice I have not shown interclade ages for L11 and X. Only downstream of L11 so those downstream interclade calculations represent a minimum age for L11 only. I also am not 100% convinced that R-L11 was born in SE Europe or SW Asia. I think Balaresque's conclusion are likely in terms of an east/west cline but it is arguable. Regardless, there is not much denying that the SNPs show us a R-L11 phylogeny that shows an explosive expansion. Perhaps clan is the wrong word. Perhaps this an extended family of paternal lineages. I'm not sure why you think such concepts are ridiculous. As far as your concerns about STR modals, etc., I'll add them to the STR Wars thread and we can argue about them over there ad nauseam (EDIT: fixed sp). PS-I dont think a lack of R1b in one Corded Ware cemetery provides any sort of significant negative evidence for R1b's absence. @ Alan - Pots are not people. It doesn't really matter exactly where a woman decided on a particular shape and decoration of a pot. That decision was not the start of a culture. The really important parts of the BB package affected the whole lifestyle and economy, and they came from Yamnaya. And they arrived in Iberia before BB. Yes the BB pottery helps to track the spread of the culture (into Britain for example) once the pottery style had melded with the rest of the package. But the rest of the package was earlier, not later. BB is just part of the bigger picture of the Chalcolithic revolution. Corded Ware is part of that bigger picture too. But Corded Ware did not give rise to BB. That has now been very clearly demonstrated from the radiocarbon dates. Yes the BB pottery helps to track the spread of the culture (into Britain for example) once the pottery style had melded with the rest of the package. But the rest of the package was earlier, not later. BB is just part of the bigger picture. Corded Ware is part of that bigger picture too. But Corded Ware did not give rise to BB. That has now been very clearly demonstrated from the radiocarbon dates. I realise people are not pots etc. I am focussed on the whole cultural and social changes involved rather than just where beakers evolved. Although one of the recent papers did questions the origin of the pots in Portugal and the radiocarbon evidence again that is not really what I am focussed on. I am not really talking about ultimate origins in the east of Europe. I am really talking about where in western Europe the complete beaker package evolved and where the spreading out of beaker groups took place from. A couple of the recent beaker papers did seems to look back towards the area of real importance being where the final beaker package emerged as being more in the beaker-corded ware interaction zone rather than the pot origin zone. So I am totally agreeing that pots are not the whole story. What I am saying is perhaps the actual lineages that spread in western Europe were in the complete beaker package zone east of Iberia rather in the partial package zone in Iberia. The idea that this was located more in the contact zone between western (partial beaker package Iberian) and eastern influences (which completed the package) was raised in one of those recent papers i.e the idea that the real impact on NW and west-central Europe was made by people who have combined western proto-beaker and eastern Corded Ware elements. Personally I am just playing Devil's advocate and do have doubts about this based on archaeological considerations i.e. the classic beaker individual burial in a barrow or otherwise are not known in areas like Ireland which were obviously on the beaker metalworking trail and were very important in copper age metalworking in NW Europe. A number of papers in the last 10 years have looked at the contrast between the Atlantic areas and the groups who look more like they have taken on board Corded Ware type behavours along the Rhine, eastern Britain etc. Look at the old HT35 Project. First off, let me say that I realize it is not likely that any of those modern men belong to the old nodal haplogroups minus any more recent SNPs. It's just that we don't yet know what branches all of them are on. That said, notice the apparent east-to-west cline as one moves through the groups, as the distance from L11 diminishes, and one gets to L11 itself. Then consider all the L11+ haplogroups in other projects and what those look like, and the movement from east to west is complete. Doesn't the general SNP picture, as captured somewhat in the old HT35 Project, make it appear that R1b moved east to west through Europe (or SE to NW)? Movement in the opposite direction would present all sorts of difficulties, it seems to me (I'm not talking about the small scale back-and-forth that goes on all the time). Add to all that the fact that we have a lot more data for western Europe than we do for other Old World locales. Frankly, I don't get the picture of Italy as the font of R1b either, unless something shut the western exits down very early so that the varieties of R1b that diverged at L23 or L51 only went east or overwhelmingly went east. @ Alan. I can see that I need to go back to Harrison and Heyd! In fact I have it open now and am picking up interesting stuff I had forgotten. The wrist-guards are middle Beaker! I don't think that this has anything to do with Corded Ware. The shift c. 2500 BC appears political - a shift of power between peoples who were related. The Stelae People had already spread west to the Atlantic by 3000 BC. As far as your concerns about STR modals, etc., I'll add them to the STR Wars thread and we can argue about them over there ad nauseum. You easyly find many mistakes in my English, and I of course in your Latin: ad nauseam. Rich, mine are speculations only by a Genetic point of view. Of course to take in consideration all the other fields is important and could be winning. There is something wrong in thinking haplogroups belonging only to a part of the world. This is clearer by considering the mtDNA rather than the Y. Haplogroup R1b1* could be present at the same time in the Caucasus and in the Alps and to have had each its own descent. It is also possible that from Caucasus to Alps or from Alps to Caucasus R1b1* migrated. What I have said is that Western European R1b1a2* derives from Western European R1b1*. I have given infinite proofs about this. The pathway from R1b1* to all subclades is here and not elsewhere. Don’t you think that someone has tested Mangino (the Tuscan Mancini) for the intermediate SNPs between R1b1* and R1b1a2* as Vincent Vizachero tested without authorization the Italian Romitti for L150-? Of course, R1b1 is a separate lineage, P297-. Even there, though, much of it seems to be Near Eastern, and, in Europe, to have a strong Jewish component, which itself could be of Near Eastern origin. Yes I read H&H last week again and I posted my thoughts but for the life of me I cant remember much about the paper and I would have to read my own post again to recall what i thought of it. All that beer is coming back to me now and I have the memory of a goldfish. I think though I am not expressing my meaning too well in this thread. What I mean is the single burial in a barrow as per classic central Europe/Rhine/Eastern British beaker culture is not a feature of the Atlantic beaker zone. A number of British archaeologists have started to see this non-far-Atlantic beaker culture as owing a lot to the single grave/corded ware influence. They make a distinction between Atlantic beaker (which some call the incomplete or proto-beaker package) and this other beaker zone along the Rhine, eastern Britain etc and tend to emphasise that the latter is almost a hybrid culture. Some seem to think the Atlantic beaker thrust and this beaker-corded ware culture met somewhere around Brittany again. Basically there is a lot of thinking and hypothesising going on and no agreement but at least the last 8 years or so have seen a new burst of thinking about the beaker problem. Of course, Barlaresque, thinks there is a east/west cline with the east more diverse (older.) I agree with that too, but it is arguable that the differences are insignificant. I also am not 100% convince that R-L11 was born in SE Europe or SW Asia. I think Balaresque's conclusion are likely in terms of an east/west cline but it is arguable. I’m rather puzzled by the fact that I get the impression here(I could be wrong!!) that Balaresque et al(2010) work was very welcome amongst some in the community, and hasn’t been subject to the same level of profound scrutiny that the Busby et al. paper was. Perhaps there are certain things that should be shown from the Balaresque et al work to allow the average user to characterize the validity of their conclusions. As we can see in Figure-1 the only West Asian population included in the analysis was Turkey, on the other hand no Eastern European population was sampled, nor populations from the Balkans. Moreover in Figure-1 shown above we see that the longitudinal correlation is very poor. In fact not taking into account that this is overall microsatellite variance of a mixed set of 10 STRs, we see that places like FR2(Baie de Somme, France) have a higher microsatellite variance than 5 regions east of them. Here is a description of Balaresque et al(2010) methodology, this is found in the supplementary text S1. TMRCA, population growth rates, and the times of individual population splits were estimated using BATWING1, under a model of exponential population growth and splitting. Standard use of BATWING assumes a random sample from a population, rather than a random sample of individuals sharing a haplogroup. Wiuf2 showed that expected coalescence times for a subsample that all share a rare allele (equivalent to a haplogroup) are approximately proportional to a sample from the coalescent, with a scaling equal to the frequency of the rare allele in the population. Other simulations performed by us (not shown) demonstrate that common haplogroups have mean coalescence times that follow the same approximation, provided sample sizes for the haplogroup are large (>100). Simulation studies of the bias and residual mean square error of point estimates (Table 1 below) show that BATWING analyses based only on haplogroups, while underperforming random samples of the same size, give realistic estimates of important parameters, and the time to the most recent common ancestor of the haplogroup. More stringent tests of the accuracy of the posterior density estimates are summarised in Table 2, below. The coverage is approximately correct for the haplogroup data-sets for the correct priors; incorrect priors gave coverages that overestimated (for TMRCA) and underestimated (for α and N) the posterior uncertainty. 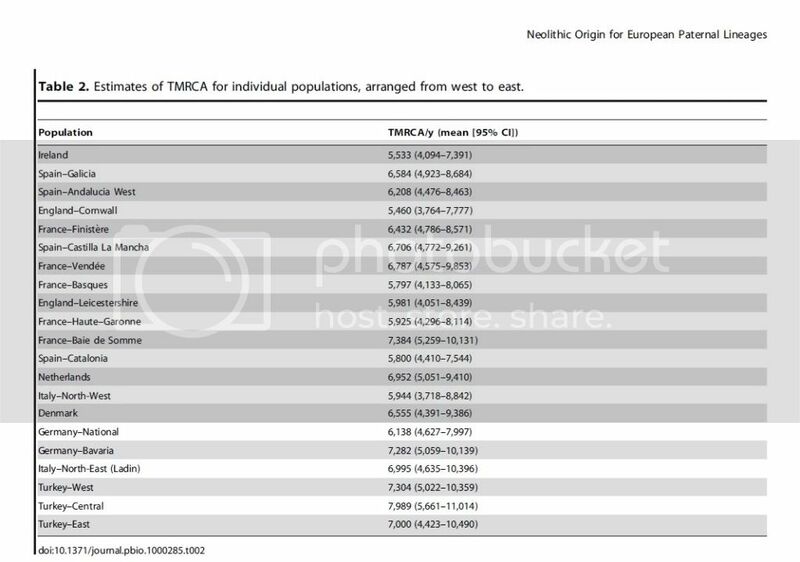 Note that there is a tendency for TMRCA to be underestimated when single-haplogroup data are considered. In choosing a microsatellite mutation rate there are two approaches to dealing with recurrent mutation and drift: one is to average over a long time period, yielding the 'effective' mutation rate3, and the other is to model mutation rates explicitly for each locus, using information from known pedigrees1. In our analyses of hg R1b1b2 data we used an individual mutation rate prior for each marker, calculated from multiple pedigrees4-15, where the parameters of the gamma distribution represent, respectively, number of observed mutations and number of meioses: gamma(22,8856) for DYS19, gamma(1,2135) for DYS388, gamma(17,7273) for DYS389I, gamma(19,7260) for DYS389b, gamma(19,7949) for DYS390, gamma(26,7897) for DYS391, gamma(4,6094) for DYS392, gamma(6,6651) for DYS393 and gamma(27,4205) for DYS439. For the initial population size, we used three broad gamma priors with both means and standard deviations of 10000, 5000 and 3000 respectively. For population growth rate per generation, we also used the broad prior distributions gamma(2,400) (mean = 0.005, SD = 0.0035) or gamma(1,200) (mean = 0.005, SD = 0.005). Since we are considering not an entire population, but a single lineage, the population size N is scaled by the overall frequency of the lineage in the dataset (~0.50). The TMRCA is calculated using the product of the estimated population size N and the height of the tree T (any scaling factors cancel). A generation time of 30 years16 was used to produce a time estimate in years. A pair of runs of four million MCMC cycles were used, with 100 attempted tree changes within each MCMC cycle. The first 1.6 million iterations were discarded as burn-in and samples taken every 200 cycles to provide 40,000 MCMC cycles for inference. Convergence was checked by comparing parallel runs and by analysing autocorrelations within runs. All statistics were calculated in the R statistics package17. I’m rather puzzled by how Baie de Somme, France having a mean TMRCA of 7384 ybp, and Bavaria, Germany having a mean TMRCA of 7282 ybp are supposed to be indicative of a eastward expansion wave from Turkey when West Turkey has a mean TMRCA of 7304 ybp, Central Turkey has a mean TMRCA of 7989 ybp and East Turkey has a mean TMRCA of 7000 ybp. So assuming the assumption that TMRCA is somewhat indicative of migration how does it make any sense that the people would make it first to Baie de Somme, France before they made it to West Turkey or East Turkey. Of course these are mean estimates and as the confidence intervals indicate the TMRCA in Baie de Somme could be anywhere from 5259 ybp(Late Neolithic) to 10131 ybp(Late Mesolithic). So I have to once more repeat what I said at the beginning, I’m rather puzzled by how well accepted the conclusions of Balaresque et al(2010) were, and how issues like the ones I mentioned have been overlooked. I think though I am not expressing my meaning too well in this thread. What I mean is the single burial in a barrow.. I followed you Alan. I was looking in H & H for single graves, but got distracted by the wrist guard thing. Not to worry. .... I'll add them to the STR Wars thread and we can argue about them over there ad nauseum. Got it. I knew something didn't look right. I welcome, with great excitement, Balaresques', Myres' and Busby's articles. Anything to get a better evaluation of R1b is good. I think, generally, all of these papers' TMRCA estimates are off, but it is a controversial area so it is clearly an open issue. None of them have adequate depth and representation in their data. The only thing I don't like about Busby is their logic flaws that, to me, are so obvious it brings up questions of the intent. So I have to once more repeat what I said at the beginning, I’m rather puzzled by how well accepted the conclusions of Balaresque et al(2010) were, and how issues like the ones I mentioned have been overlooked. There is a bit more to the story. One of the logic flaws that Busby had was the relegation in STR diversity calculations to R-L11(S127). Myres, I think, actually did the best job of mapping out the phylogeny and trying to overlay that whereas Barlaresque looked at STR diversity at the R-M269 level. By more to the story I mean this - None of these paper was comprehensive, but if you look at long haplotypes and deep SNP testing you can see that R-L23* in SW Asia/Caucasus does have a significant step up in STR diversity over R-L11(S127). There is the "paragroup" issue so nothing is conclusive... but keep in mind where home for R1 probably is, and brother R1a. Even though it is outdated and the timeframes may be wrong, it is important to read Spencer Wells' paper - "The Eurasian Heartland: A continental perspective on Y-chromosome diversity." Wikipedia, yes not the best, has R1* listed from a study including Iran. I don't think any has been found in Europe? The only thing I don't like about Busby is their logic flaws that, to me, are so obvious it brings up questions of the intent. How obvious are the logic flaws of the Busby et al(2011) paper? I ask this because they aren't that obvious to me, perhaps you could expand on that? There is a bit more to the story. One of the logic flaws that Busby had was the relegation in STR diversity calculations to R-L11(S127). Not quite, refer to figure-2b and you will clearly see that they calculated the bootstrap variance for RxS127 or R1bx(L11), and it clearly shows that the highest variance occurs in Central Europe. “the presence of G2c-M377 chromosomes in Pathans might represent phylogenetic signals from Khazars, a common link between Pathans and Ashkenazi groups, whereas the absence of E1b1b1a2-V13 lineage does not support their professed Greek ancestry”. (Harlette Lacau et al., Afghanistan from a Y-chromosome perspective, European Journal of Human Genetics advance online publication 18 April 2012). Sincerely I don’t know how much will remain of “Jewish” after all these researches, and we are waiting from so long the aDNA from Palestine. Upon this is based my theory of the Italian Refugium. Jews have many origins. I discuss this from many years, above all from the times of Sam Vass.